Many of us LCI members use email on a daily basis. It seems that often you are inundated with many worthless messages, but then, occasionally, one arrives that just makes your day a whole lot better. This particular email arrived in my inbox on July 14, 2016. It was from a gentleman from Italy, named Claudio Morino, who identified himself as a Italian Army Officer. He is president of the Underwater Battlefield Organized Anzio Team which uses the acronym U.B.O.A.T.. His team had located a wreck of a ship on the sea floor of the Mediterranean off the Anzio shore. They had a tentative identification as a US Navy landing ship, possibly the USS LCI(L) 20. Prior to the July 1943 assault on Sicily the LCI’s in Flotilla 1 practiced landings on the shores of North Africa. This photo was released to the press on July 10 1943. LtC Marino requested any information that I had in my possession that would enable them to make a definitive determination. I sent them detailed drawings with measurements of a Class 1-350 Landing Craft Infantry, and a picture of the LCI(L) 20 aground after being hit by the German Bomb. I also included the Action Report written by the Ship’s Captain, Lt (jg.) Frank Chambers which covered the events leading up to the LCI(L) 20 being abandoned and burning on the shore. From that information, they concluded that the ship that was located just 60-70 yards from the shore was the ill-fated USS LCI(L) 20. 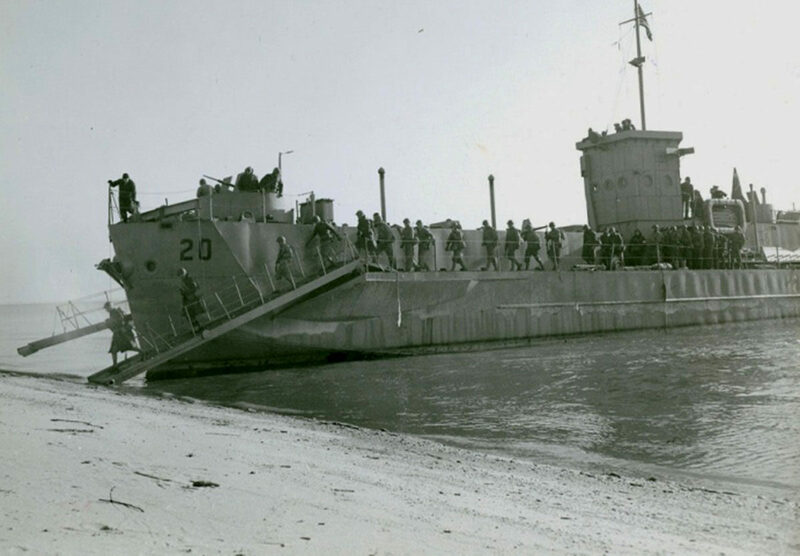 The LCI(L) 20 had a relatively short period of active service: from Commissioning on December 11, 1942 to its final landing on January 22, 1944. Like most of LCI Flotilla 1 the ship and crew saw service in North Africa and later in Italy. They had participated the landings under fire at Sicily and Salerno so by the time of the events at Anzio the ship and crew were experienced battle veterans. This was picture was taken just moments after the LCI(L)20 was struck by a 500lb bomb released from a German FW 190. Note that just forward of the 3 and 4 guns, the aft part of the deckhouse is almost level with the conn due to the force of the explosion. The Soldiers are still disembarking down the starboard ramp. The photographer is unknown probably because he had used an illegal camera. The force of the explosion ripped open the fuel oil day tanks and covered the engine and crew’s quarters with approximately 800 gallons of fuel oil which caught on fire after the explosion. Foamite, fire hose, fog nozzles and all firefighting equipment on the forward part of the ship and were passed to the crew on the stern who were acting on orders of the Executive Officer and Engineering Officer, attempting to extinguish the fire. The explosion also destroyed the fire mains, water pump and handy billies. CO2 extinguishers and foamite were the only firefighting equipment left intact. Orders were given to flood the magazine, but that was impossible due to the fact that the mains had parted. …The crew continued to fight the fire until ordered to abandon ship. At the time of abandon ship, the fire below the weather deck spread from the engine room forward to frame #46 and in the deckhouse to frame #46. When word was received from the men on the stern that there was a great possibility of the ammunition blowing up, the commanding officer ordered all hands to abandon ship. LCI(L) 20 Burning on the beach; to port side is the LCI(L)39 temporarily disabled due to a near miss (l to r) HM LCI 242, LCI(L)20, LCI(L)39, HM LCI 260, and further down the beach LCI(L) 38 and LCI(L) 44. My Dad’s ship, USS LCI(L)-211 suffered a similar fate during the Anzio invasion, but was repaired and put back in service. They had a 500 pounder hit right behind the forward gun mount. It penetrated the deck and exploded below decks. My Father was the bow deck gunner and was seriously injured, but his ammo feeder was killed. Dad was blown out of his harness an onto the deck. He was hospitalized, but returned to duty aboard 211 in time to make D Day landings on Omaha Beach. My cousin’s LCI (L) 32 hit a mine on Jan 26, 1944 while assisting the LST 422 carrying the 83rd mortar battalion. He helped evacuate but could not save himself. An Italian diver visits the wreck regularly. There is a movie on You tube. He assured me hecwould say along tonmy cousin and fellow shipmates on his next dive. I have been looking for years for a photo of the 32 without any luck. 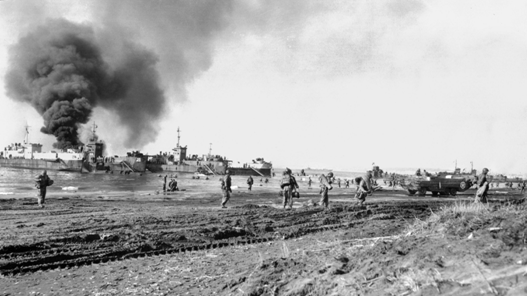 My cousin’s LCI (L) 32 hit a mine on Jan 26, 1944 while assisting the LST 422 carrying the 83rd mortar battalion. He helped evacuate but could not save himself. An Italian diver visits the wreck regularly. There is a movie on You tube. He assured me he would say along (?) to my cousin and fellow shipmates on his next dive. We are sorry for the loss of your cousin on board the LCI 32. His bravery and sacrifice are appreciated. Our organization is interested in honoring LCI sailors and preserving their legacy. Any information you can provide to us would be especially helpful. The following information would help us honor your cousin’s service. 1. What was your cousin’s name? Do you have any of his World War II photos of himself or shipmates? Did he keep a diary or are there any of his letters he sent home? 2. How did you find out about the diver who visits the wreck regularly? Do you know his name and how we can contact him? 3. Do you know the website link for the “movie” you mentioned that is on You Tube? Lt. Delbert B. Mallams, Paul Louis Nardella, Ralph Harding, Charles Cox, David Purcell. If you have any other information you would like to share with us, please contact us. Thanks again for visiting our website. Please note that other LCI National Association Officers or Board members may provide you with additional information. My father was on the LCI #10. He never spoke about the war to me, his daughter, as I grew up. Now that I am older, my heart breaks for all that had been in this war, and lived to see the horrors. Linda: In a separate email, I provided you with additional information regarding the LCI 10. Judith: In a separate email, we have provided you with some additional information on the LCI 20. Video of the wreckage of LCI 32 that was sunk during the Anzio invasion. Video taken by Italian Diver Fabio Bartolucci.